Larry McElwain is pictured in this file photo from May 4, 2017. 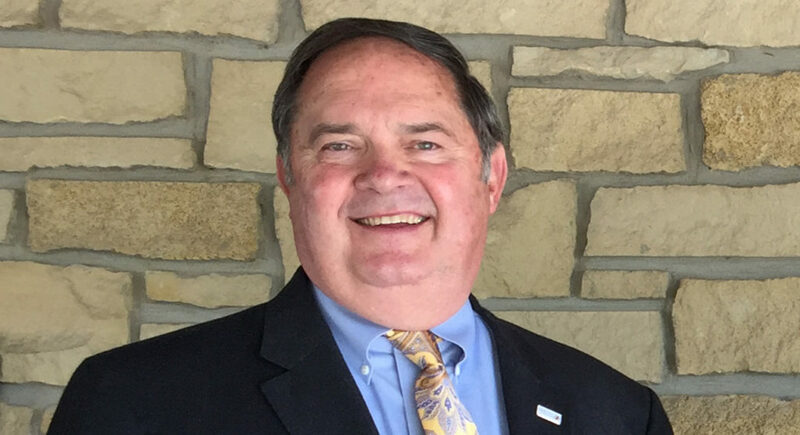 Larry McElwain, president and CEO of the Lawrence chamber of commerce, is retiring at the end of January, the organization announced Wednesday afternoon. McElwain has been in his current role since 2014 with the chamber, which in addition to serving as an advocacy organization for area businesses also oversees economic development recruitment efforts for the Douglas County area. McElwain, 70, said it was time to spend more time with his children and grandchildren. Plus he said the chamber was in a good position currently, with strong relationships with the city, the county, the University of Kansas and many neighborhood groups. McElwain spent more than 40 years with Lawrence-based Warren-McElwain Mortuary, serving as co-founder and chairman of the company. Having worked with thousands of Lawrence families in that business, McElwain — who had never been a chamber executive before — was touted as someone who could build new relationships for the chamber. On Wednesday, McElwain said that was one of the more satisfying parts of the job, and he said the chamber has started to see tangible results from the increased relationship building. The chamber in early 2017 completed a $1.8 million fundraising campaign to support economic development in the community. It was the largest such campaign the chamber had completed. “We had never done that before in Lawrence, and it was time for the private sector to step up and show we can be that type of partner,” McElwain said. Other economic development efforts have had mixed results. The community is still seeking its first tenant for VenturePark, the business park on the eastern edge of town that has been vacant since it opened in 2014. But a Kansas City development firm, VanTrust Real Estate, is constructing a large industrial building at the property that it hopes will attract a tenant. McElwain said he’s optimistic about those prospects. He also said it will be critical for the chamber to continue to strengthen its retention and expansion program to help ensure that businesses already located in Lawrence feel like they have the resources to expand here. He said work also is underway to develop a more formal economic development plan that has KU as a major partner in the process. McElwain’s last day will be Jan. 31. The chamber’s executive committee has begun the process of forming a transition team to help with the change in leadership. No timeline was announced for hiring a new CEO. McElwain said he plans to remain in Lawrence after his retirement. “I have been truly blessed to lead this important community organization, doing what I could to serve the many wonderful residents in our region,” McElwain said.